Step 1 - Set hearth and back slab in position. Step 2 - Set up jambs, at either side of the back slab to correct width, with the jambs sitting in the hearth mark the position of the fixing lugs on the wall at the side of each jambs. 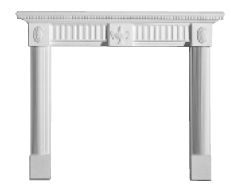 Step 3 - Set the head of the fire surround onto the jambs in the correct position and mark the lugs on the wall. Step 4 - Drill and fit the plastic plugs into the wall at the marked positions. Cut the plaster away so that the lug projections is recessed into the wall. Step 5 - Put the jambs and the head back into position and screw into the plugs. Make good all the joints and fixing positions. Need help or would like your fireplace surround professionally fitted?